Cracks in stone walls can be caused by many different problems. A stone wall may begin to crack due to the soil underneath and around it settling over time. Moisture will be able to gather in this crack, and when the moisture freezes, the crack will be forced open wider. As more and more settling occurs, and the freeze/thaw cycle continues, the crack will continue to grow and become worse. Pieces of stone and mortar will eventually begin falling out of the wall. Fixing the crack will seal out at least a small portion of the moisture that would otherwise gather in the crack and make the problem worse. Allow the crack to stop growing. Do not attempt to fix a crack when it begins to form because it will continue to grow and form until the wall stops moving. The movement is caused by ground soil settling. This process cannot be sped up or slowed and may take a year of more to stop. Chisel the crack out with a masonry chisel and a mallet. Doing so will allow you to clean the crack out, free loose stone material and mortar, and create an environment that will accept new mortar readily. The crack will likely follow mortar joints because they are weaker than the stone in the wall. If the crack goes through the stone, chisel it out, too, and continue with the process. Brush the crack out with a small hand broom to remove dust and debris. If you can, blow the crack out with an air compressor, so the interior of the crack is good and clean. Mix masonry mortar to the correct consistency (about the consistency of thick peanut butter). Turn a pointing trowel upside down, and place some of the mortar on the bottom side of the trowel. Hold the pointing trowel up to the crack, and use a tuckpointing trowel to slide the mortar off of the pointing trowel into the crack. Pack the mortar tightly into the crack. Allow the mortar to set up for 20 to 30 minutes. Run the tuckpointing trowel over the crack to finish the mortar. 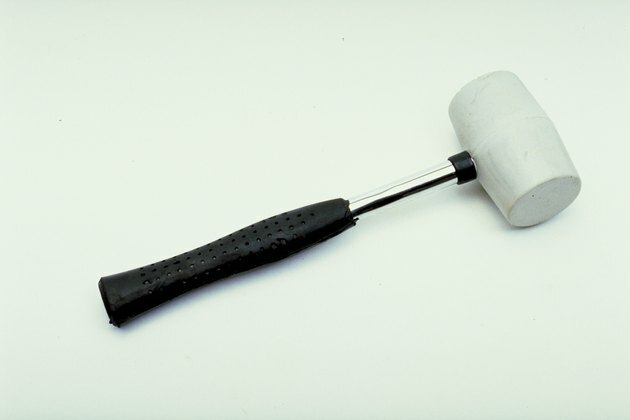 Brush mortar crumbs off or the stone with a soft bristled broom, and allow the mortar to finish drying.